Turn Your TV into An Underwater Aquarium! Enjoy scenes from The Florida Aquarium’s best tanks. Uses a fixed shot to create the illusion that your TV is an Aquarium. Showcases exceptionally clean tanks with crystal clear water. Uses real life fish! No computer animation. Features aquariums with incredible reef and live plant backgrounds. Recorded especially to fill any (standard, plasma, LCD and all others) TV screen! Easy to loop any of the five individual tanks (3 saltwater or 2 freshwater) or play all five fish tanks in sequence. Hear the Dolby Digital Sound of an actual aquarium. Just the right classy touch for parties, office environments or romantic occasions. Programmed to play in all major DVD players. We set out to make the best aquarium DVD on the market by filming the finest fish tanks available. We did a lot of research on the current DVDs on the market and we found quite a few areas we could improve upon. 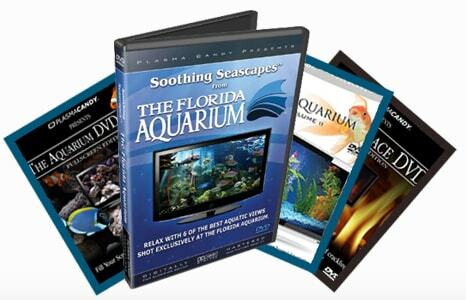 You’re sure to enjoy the 5 elegant fish tanks (2 freshwater & 3 saltwater) included on this DVD. Sit back & relax with these impeccably maintained tanks with crystal clear water and vibrant healthy fish.